Camerata Europaea (CE) is a cultural organization with orchestras – in Berlin, Innsbruck and Athens, of superb musicians from across the European Union. 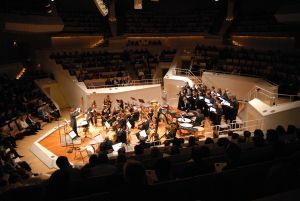 This unique new organisation was formed in 2007 in the metropolis Berlin to encourage the dialogue between European countries and form a greater understanding through the universal language of music. Both, the remarkably versatile orchestras and their repertoire, reflect the distinctiveness and variety of the European nations. Concerts are dedicated especially to presenting the works of European composers in extensive performances throughout the European Union. CE is also keen to foster the talents of emerging young artists and will proudly represent Europe on the world stage. Vibrant and innovative concert programs unite traditional with the contemporary, familiar with the obscure, offering insight into the cultural treasures of Europe today. Works are selected to give equal precedence to preserving the diversity of the European music tradition and to cultivating developments in contemporary music.